I discovered this recipe through the Kicthy Kicthen and felt compelled to repost it! 1 cup Golden Brown Sugar. ½ teaspoon Cayenne Pepper (Also know as Guinea spice). Meanwhile, blend the sugar and pepper together in a bowl. Taste it. If it’s too spicy, add more sugar, not spicy enough, add more cayenne. However, the spice does become a little more pronounced after being cooked, so be aware of that. 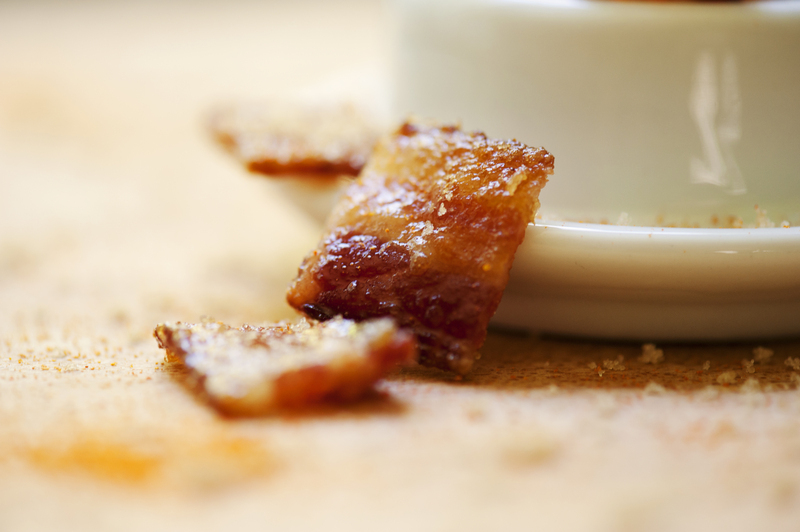 Lay the bacon on a cooling rack placed over a baking pan lined with aluminum foil (these means minimal clean up!). Cover each slice of bacon with the brown sugar mixture. It should be an even layer, thick enough so that you cannot see the bacon through it (about 1/8 or ¼ of an inch). Place the bacon in the oven for about 10 minutes, or until the sugar is completely browned, and the bacon has curls at the edges and appears mostly cooked. Remove the bacon from the oven and flip. Cover the bacon with the rest of the brown sugar mixture, and pop back in the oven for another 4-6 minutes, or until the bacon appears fully cooked, like crunchy, but not burnt. If the bacon seems underdone, just leave in the oven for a minute or two more. Let the bacon cool on the rack for at least 15 minutes to let the sugar harden a bit before you start cutting the pieces. I find it’s easiest to use a pair of kitchen scissors and cut the pieces over the serving bowl. Serve it up with the libation of your choice and enjoy!